We met on a Sunday morning after church. Fortunately for us, we got there just ahead of a major rush, and got a great table. While I can’t rave about the service, I have to give them the benefit of the doubt. It was after all, a Sunday morning. The menu is huge! Oh my gosh, I didn’t know how I would narrow the choices down on what to order. Somehow I eventually managed. I decided that I would go with the Crab & Avocado Omelet. This is a three egg omelet with jack cheese, tomatoes and scallions, topped with bacon and asiago cream sauce. This is served with red skin potatoes, a freshly baked muffin and fresh squeezed juice. Virna (who is a horrendous copycat, just for the record) got the same thing. The choice of muffin flavors was low-fat blueberry, carrot & raisin, and I third that I can’t remember now. I ordered the carrot and raisin. Once again CC-Virna ordered the same. Now the muffin was something else! Aye yi-yi! We are talking muffin here, folks. As in MEGA-MUFFIN! This baby was huge! And so good. But it was served with the tiniest bit of butter. Come on! A muffin this ginormous deserved better! However our server gladly obliged, bringing us extra butter. I don’t know about the other muffin flavors, but the carrot raisin is the way to go in my book! Bob chose the Shrimp and Feta omelet. This had sautéed shrimp with feta cheese, tomatoes and scallions, topped with bacon & asiago cream sauce. All omelets are served with the same sides. Fresh fruit can be substituted for the potatoes at an extra charge of 50 cents. Bob totally enjoyed it. Umm, yeah I tasted it. Well I had to if I was to blog about it…right? Clint got the Mixed Berry Pain Perdu Breakfast. This is French toast stuffed with cream cheese and orange marmalade and topped with fresh strawberries, blueberries and strawberry purée. The breakfast is served with two eggs and bacon or sausage. It sounds awesome on the menu and I came this close (*holding her fingers just a smidge apart*) to ordering it. But when it came, we all kind of looked at it and then looked at Clint. Um, maybe he should have gone with his other choice? That would have been the awesome looking Ciabatta Breakfast Sandwich that walked by right before we placed our orders. (Okay, the server walked by carrying it. The sandwich didn’t walk. You are all so picky on details…jeese!) He said it tasted good. However, it looked like Bryce had more on his child’s plate. I think maybe Clint had to go through McDonald’s drive thru on the way home! The coffee was hot, the orange juice was fresh squeezed, the service was a bit slow (but after all, it was Sunday morning and we all know that’s when the “blue-hairs” are out in droves) and the food was good. Overall, Mimi’s was a definite thumbs up! Would I go there again? In a heartbeat! I was looking for images of these breakfasts and stumbled upon your blog. When I visited my friend in Texas I ate here several times...I didn't forget about the delicious stuffed french toast breakfast with berries and a hint of orange and neither has my daughter. We both loved this breakfast. I had forgotten about the crab and avocado omelet but now that you posted about it I remember how delicious that was too. Their fresh squeezed orange juice is freakin awesome and the carrot muffin is def to die for. 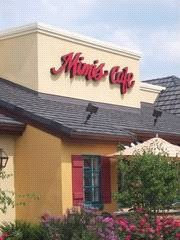 :-) Thanks for this post...its making me very nostalgic and I just wish I had a mimi's cafe nearby!